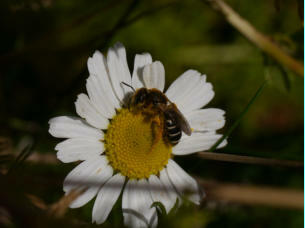 Halictus rubicundus is one of the commonest solitary bee species in Ireland. While bumblebees and honeybees are the most well-known, solitary bees comprise the majority of the Irish bee fauna (80 species, compared to 20 bumblebee species and one honeybee species). Solitary bees, despite their name, can occur in large colonies but their name refers to the fact that they are not usually eusocial: i.e., they do not have queens and sterile worker castes but instead each female rears its own brood. Halictus rubicundus is a member of the Halictidae family of bees. Bees in this family are often called sweat bees because they are attracted to human sweat. 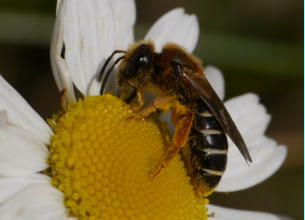 However, Halictus rubicundus (and other Irish Halictidae) do not, in my experience, display this behaviour. The Halictidae family are also interesting from an evolutionary perspective because of the diversity in their social behaviour with several species showing varying degrees of development of eusociality. Halictus rubicundus is particularly interesting as it is socially polymorphic with southern/low altitude populations (including populations in Cork) displaying eusocial behaviour while northern/high altitude populations are solitary. The eusocial and solitary populations are not genetically differentiated and transplant experiments show that individuals from solitary populations can display eusocial behaviour, and vice versa. Its social polymorphism is due to the effects of environmental conditions: in cold climates the growing season is too short to allow the development of the two generations that is required for eusociality. Halictus rubicundus typically nests in small aggregations: a British study found nest densities ranging from 18-304 nests/m2. Each nest is founded by a mated queen in spring. In the eusocial populations the queen then rears a brood of 5-8 workers. These workers then help the queen to rear a seond brood of males and reproductive females. 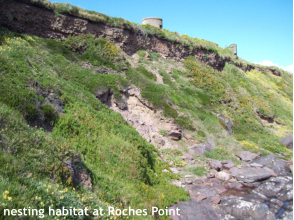 Due to this life cycle, eusocial populations have long flight periods: at Roches Point my earliest and latest dates are 24 March and 5 October. 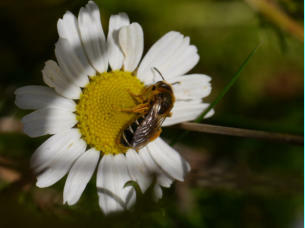 Halictus rubicundus is also one of the few solitary bees that can be identified in the field due to the distinctive combination (in the female) of ginger hairs on the thorax, white hair bands along the posterior margins of the otherwise black abdominal segments and the orange tibia and tarsi on the hind legs. Note that various other solitary bee species can also show prominent white bands on the abdomen so details of the wing venation should be checked to confirm the identification until you are familiar with the species. Halictus rubicundus has been widely recorded in Ireland (distribution map) and is widespread both along the coast and inland in east Cork. 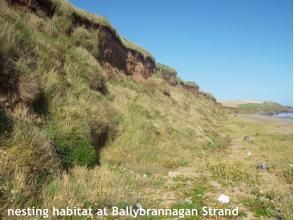 On the coast, nesting colonies occur on low, eroding, sedimentary cliffs at places like Roches Point, Gyleen, Inch Strand and Ballybranagan Strand. From my observations, it seems to prefer the lower and/or more sloping parts of the cliffs as opposed to the higher and/or more vertical faces. Inland, I have found colonies in old quarries and on steep roadside banks. The females can be seen visiting the nest holes and resting on the bare cliffs, while both sexes visit a variety of flowers.